THE ISOBEL JOURNAL is no ordinary snapshot of a contemporary teenage life. A charming and vivid narrative scrapbook of the eighteen-year-old author's sketches, mini-graphic novels, photographs and captions, it captures her wit, her observations and her creative talent as she takes us through the three central themes in her life: 'Love', 'Friends, Art and Otters' and 'Me'. Resonant of Laura Dockrill's MISTAKES IN THE BACKGROUND and with the powerful naïve illustrative style of cult Japanese artist Yoshitomo Nara, this is a collector's gift for teenagers and all who have the teenage experience still in their hearts. Readers will emphasise with this witty and honest journal of a girl getting to grips with impending adulthood. A must-have for all hipster teenagers and anyone who appreciates the raw creativity of youth. Enchanting and poignant. The Isobel Journal by Isobel Harrop is a quirky, creative and fun scrapbook of the artist and author’s life. It is full of fun and feeling and a great accomplishment for 18 year old author. I didn’t know very much about her or her story coming into it, but as soon as I began turning the pages, Isobel’s voice was clear and engaging. I felt as though I was reading her journal/scrapbook and I immediately found similarities with myself and Isobel. Filled with awesome drawings and sketches, The Isobel Journal is a entertaining and charismatic read that I simply loved to bits. The Isobel Journal is a short read that I gobbled up. It took me about 20 minutes to read and once I was finished I forced my sister to read it and she took no longer than I did and loved it as well. 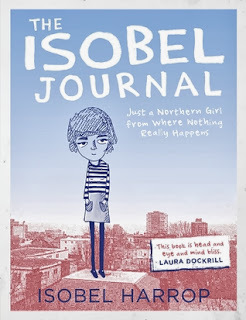 At first glance I could understand how The Isobel Journal could be mistaken as a lengthy picture book but it is scrapbook formatted and targeted at a teenage audience as it does deal with teenage themes. It is a contemporary that doesn’t necessarily have a storyline and does go from thing to thing, but it didn’t need to have a specific plot. It just worked! Somehow even though it was around 180-200 pages (I’m not sure the exact amount) I felt everything was told in the right dose. I just got this immediate sense of comfort with Isobel because I even though younger, felt like I could relate and empathise with her. I’ve been using fun a lot in this review because it was definitely a fun read and an uplifting one too. It’s quirky and random but that’s one of the things I loved about it. I feel like it was a perfect snapshot of all those teen emotions and as a teen reader, it’s great to be able to pick up on that level of understanding and experience. For some reason the word ‘individual’ keeps popping up in my head because the Isobel Journal was somewhat Individual. It was different from a lot of books and it’s it’s originality and uniqueness are one of the shining points of the novel. It was a great debut and it’s still hard to believe that Isobel Harrop is only 18 years old but at the same time it also makes sense. I adored all the drawings throughout the novel and there was always something to look at and admire. I really liked that it was formatted to look like a scrapbook and I now feel inspired to create my own. I’ll definitely be re-reading this one in the near future and it made for a great afternoon read. Hah! What a cute cover :D I haven't heard of this one before but it sounds perfect for summer laziness. 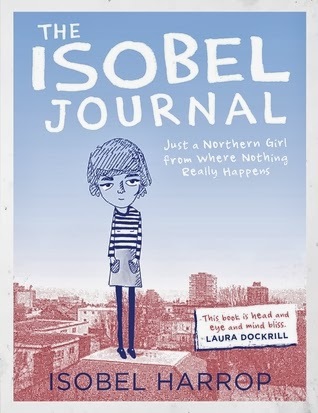 I'm really into graphic novels at the moment and The Isobel Journal sounds like such a unique one - I really can't wait to read it! I've been eagerly anticipating its release for a while, and I'll definitely be on my way to a bookshop when it comes out. Lovely review! This book sounds so cool. It seems like it is a very personal book which is enabled to connect with the readers. Great review!!! I haven't heard of this book before but I like the sound of the journal/scrapbook format. It would definitely be visually appealing. Sounds like a fun read hehe :) Thanks Sunny! Aw, this sounds very cute and fun! I like the sound of it and its format. Thanks for the heads up! I'm Sunny, a reader, fangirl and intersectional feminist passionate about all things books, feminism and pop culture. Welcome to my corner of the web, A Sunny Spot. GIVEAWAY: A Sunny Spot Turns 7! Sunny has read 5 books toward her goal of 35 books. © A Sunny Spot. Design by FCD. Header using graphics from Freepik.